Travel bloggers best dozen: My 12 best posts in 12 categories, from the last 12 months. I have been nominated by Dani and Jess from the Globetrotter Girls to participate in the Travel Bloggers Best Dozen. It involves sharing my 12 best posts, in 12 different categories, from the last 12 months. Here goes! 1. Most Popular: Interview with Kristin who is doing a travel project involving eating at every vegan restaurant in America. My interview with Kristin from Will Travel For Vegan Food. 2. Most helpful travel tip: Best Cheap Vegan Food in NYC. This was also a popular post. I spend two months a year in NYC and these are my favorite go-to spots for cheap, mouthwatering vegan food in the world’s best city for vegan food. 3. A post that was surprisingly successful: What to do when your hotel minibar has sensors and you want to put your own food in it. This post got quite a bit of Google traffic from people searching for info about minibars in general – eventually Google stopped sending the traffic so I guess they figured out the post wasn’t about buying a minibar. 4. 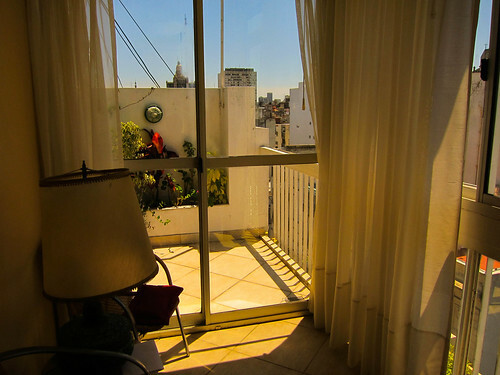 A post I thought was under-rated: Renting an Apartment in Buenos Aires. This was a guest interview that forms part of my series on 1-3 month apartment rentals around the world. Stephanie from 20sTravel gave great tips for renting an apartment in Buenos Aires, but the tips are also extremely useful for avoiding problems when renting an apartment anywhere. 5. Most controversial: Nothing – I’m dispositionally thin-skinned. If I ever write anything controversial, it won’t be intentional! 6. Most amusing: My Discount Shopping Tips for Foreign Visitors to the US. This post reveals what a cheapskate I am. 7. The post I’m most proud of: Interview with Winners of the Amazing Race – Josh and Brent, The Beekman Boys. I asked Josh and Brent if I could interview them before I knew they’d won. I have been following them for years, and I am so incredibly pleased for their success in winning the Amazing Race! 8. Best travel story or travel perspective/9. Best travel adventure. I am a funny sort of travel blogger. I’m not very interested in writing about trips I’ve done on my own blog. I most often do that when I get guest interviewed on other blogs, and use 30Traveler either to post travel tips I’ve accumulated via multiple trips, or as a way to find out information I want for myself for future trips e.g., my overseas apartment rental interview series, and my Europe for vegans interview series. My most adventurous trip of 2012, by far, was to an island in Tonga with no electricity, no tourists, 3 Tongans, and pretty much no way off the island – in the middle of a terrible rainy season. It was like Lost and Survivor rolled into one. But… I never got around to blogging about it here. Oops!! I did however talk about it on a podcast interview for QiRanger. The video below starts at my bit. 10. Best cultural perspectives or insights. See above interview for this one too. Tonga is the only nation in the South Pacific never to have been colonized and has a very interesting culture, including that Tongans sometimes take machetes in their carry on luggage on domestic flights, and that you can buy them off the shelf in the local general store. 11. Most beautiful, and 12. Best photo or photo gallery: Oahu’s Best Beaches (Hawaii). I am a beach snob. I don’t like waves, and I only like bath-temperature water. These are my ratings and photos of Oahu’s best beaches. Oahu = the main island of Hawaii where Honolulu and Waikiki are. I could look at pics of Hawaii all day (and do when I need a pick me up!). If you’d like me to tag you as the next person do complete these questions, let me know!